When I first heard of this project to get quilters to make a 6x8 flag to fly in Boston to comfort and heal those in Boston and share our love I knew I had to participate. What a wonderful sight it is going to be to see all those flags flying at he Museum of Fine Arts in Boston May 23rd thru June 16th. I just wish I could see it in person. I was planning on making two of these but am just sending the one. From the looks of it lots of flags are coming in from all over the world so I am sure it will be in great company. If you want to put one together you have until May 21st to get your flags to Boston. You can find all the info you need one how to construct one so that it is the correct size by following the instructions found HERE . I found the shoe pattern over at Paper Panache for free. I thought the sneaker would be ideal and the size of the pattern was perfect for this project too. 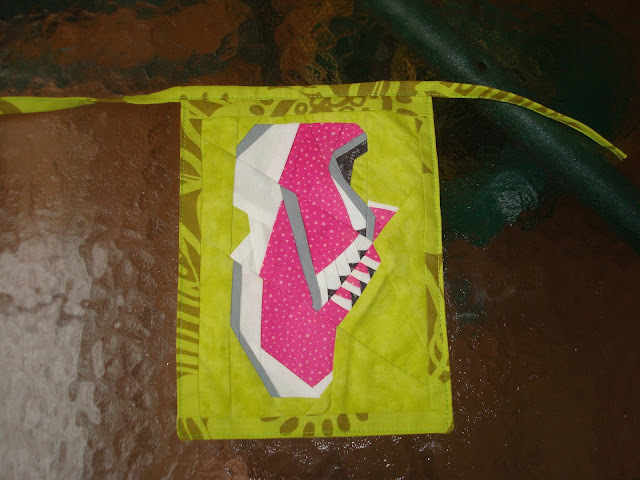 If you are interested this is the shoe pattern I used from Paper Panache. I really wanted to make a blue shoe also but just never found the time but when I was looking thru the flickr group for these flags Rebecca Lynne had made this shoe in blue. Yeah!!! I love that my shoe will have another one there !!! To see all the beautiful and inspirational flags be sure to check out the flickr group for these flags. All I need to do now is get this out in the mail. If you do not belong to a Quilt Guild that is collecting these you can mail it to Amy Friend from During Quiet Time. Her address is on her blog and can be found here. That is a geat shoe flag. I love the colors. I hadn't heard of this project. very good idea. I made that block for my sister's quilt. Well worth the time it took for all those tiny pieces. She loved the detail in it.